This month, I had narrowed down my possible choices for recipes within a day or two of getting my assignment. I saved a total of 17 recipes. I had planned on making at least 2 and possibly 3 of those recipes. Then the month flew by and before I knew it, I had completely forgotten to plan out purchasing and making the recipes and had to make with what I had on hand. So now I'm sure y'all are wondering what awesome blog I got that had me narrowing down to a whopping 17 recipes...and that blog was Karen's Kitchen Stories. It is written by Karen, if that wasn't obvious, who is a mom, grandma, and overall awesome lady! 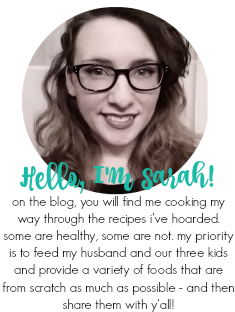 She started blogging as a way to document the recipes that were making a mess of her kitchen - I can definitely relate there ;) I love her about me page - it's informative and makes me want to redo my own. Karen's blog has an impressive amount of bread recipes and that is where a majority of my saved recipes were. I saved her Basic Sourdough Bread, No Knead Quinoa Bread, Gruyere Cheese Bread, Corn & Jalapeno Rolls, and Cheddar Chive Bread. Karen also has some breadlike recipes that I want to try: Whole Wheat and Cheddar Mini Crackers and !!!!! !POTATO LEFSE!!!!!! My grandpa sends me lefse every year around Thanksgiving. I still have some in my freezer right now. The recipe that I was going to make was her Roasted Jalapeno Salsa. But as I said, I completely forgot to plan the ingredient purchases and make it. Group C's reveal day came around last Monday and I was fretting our upcoming reveal day. I started to look through the dessert recipes I saved that included a few cookies, a cheesecake, and a Chocolate Chip Cookie Dough Fudge recipe. I had all the ingredients for the fudge, so the fudge is what I made. I do hope to make the other recipes very soon. The breads all sound so so delicious. And the salsa and bruschettas are gonna be amazing too. This fudge features safe-to-eat cookie dough - no raw eggs! It is the very typical rich fudge and it's hard not to want to eat quite a few little squares at a time. I didn't think about how the oven was on for Nick's birthday cake, so my mixture didn't cool as much as it could have for the chocolate chips to be mixed in. I also had my mini chocolate chips just disappear into thin air, so I just used regular-sized ones. Personally, I think the bigger chips were just fine and I feel that I probably will prefer them to the minis. But that is totally up to the maker if they want big or small bits of chocolate. I just have to say that the cookie dough is divine. OM NOM NOM. Thank you, Karen, for sharing such a great recipe on your blog. And thank you for the 16 other recipes that I know will be just as wonderful as this one! Using parchment paper, line a 8-inch square dish with the ends hanging over the side. For the cookie dough, cream together butter and sugars until smooth and fluffy. Then add vanilla, salt, and heavy cream. Once combined add flour. For the fudge, heat butter, brown sugar, salt, and cream in a medium saucepan over low. Stir until sugar dissolves in melted butter. Take the saucepan off the heat and mix 1 cup of powdered sugar in at a time. Then add the vanilla. Mix in cookie dough and let sit until it cools slightly. Stir in chocolate chips and pour into a pan. Smooth out fudge batter evenly. Refrigerate for at least 3 to 4 hours. Cut into 1-inch squares. Keep refrigerated until eaten.